Piper Jaffray’s "Bullseye" Craig Johnson tells Financial Sense Newshour that the long-term (secular) bull market in the US is not over and believes the S&P 500 will reach 2135 by the end of this year. Craig argues that his technical work, as well as breadth and sentiment indicators do not point to an end of the bull market. He acknowledges a slow growth environment, but disagrees that we are in a deflationary spiral scenario. Looking to 2016, Craig sees the economy progressing slowly, and the market having a middle-of-the-road year, possibly reaching 2350 on the S&P. He continues to favor the health care, consumer cyclical and financial sectors. Important note: Since we started following Craig’s work and regularly interviewing him on the show, his views and forecasts for the market have so far been extremely accurate. For example, in November of 2012, while stocks were mired in a downtrend and fears were rampant that the bull market had come to end, Craig, the Senior Technical Research Analyst at Piper Jaffray, told listeners that stocks would climb a wall of worry and rally nearly 50% higher in the next 24 months (see here), reaching a target of 2000 on the S&P 500 (it was trading around 1350 at the time). The market bottomed that very day and, true to his words, climbed relentlessly higher over the next 21 months before reaching his target in August of 2014. Since that time, Craig’s technical and fundamental research on the market and year-end targets for the past 3 years have been remarkably accurate, even within range of just a few points numerous months, if not years, in advance. We highly recommend our readers to consider his comments below or to listen to the entire interview, which will this Saturday on the Newshour page here and on iTunes here. "Let me define it this way...when I look at where this bull market started, a lot of people are measuring it off of the March '09 lows—I think that's a good starting point to anchor it, however, nobody knew including myself that this was anything more than a rally until we finally broke topside of the 2000 and 2007 highs at about 1550 [on the S&P 500]. At that point in time it was confirmed that we were starting a new secular bull market and where you would correctly draw the lower band of this secular bull market is off the right shoulder of the 2008-2009 lows. And when you do that you will see, and you will notice from the pullback/correction that we experienced in the August-September timeframe, we never violated the lower end of that price channel. So from my perspective Jim what we had was a correction in the context of a secular bull market that is still intact. 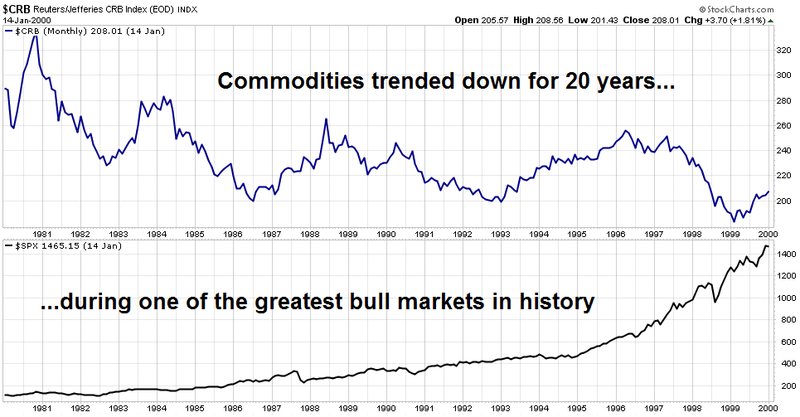 And this bull market was not confirmed until January of 2013 to be precise." "There's a lot of discussion that because commodity prices keep falling and oil prices are under pressure that we are entering some new deflationary environment, and I just put my hands on my head and look at this and say when you go back and look at the CRB index, or if you look at a long-term chart of oil, some of the best long-term secular bull markets in history have happened in a declining commodity environment. And why are we in some new deflationary spiral as people want to believe? I do not agree with that at all and history and the charts certainly prove that out." "Our official year-end price objective for the S&P 500 is 2135. I would say that the number we had previously, 2350, is a number that could be achieved perhaps next year... I think the economy will continue to get a little bit stronger as you progress throughout the year and I think in terms of the market, I think it will be a decent year, but I'm not sure it will be one of the best performing years. I think it's going to be more of a middle of the road for next year. We have not officially laid out a year-end price objective for 2016 yet but if you invite me back on the show in December I'll probably have the number laid out for you." Listen to this full interview with esteemed market analyst Craig Johnson Saturday on the Newshour page here or on iTunes here. Subscribe to our weekly premium podcast by clicking here.